The live stream of the ASSL/ACCP Regional Recognition awards for 2018 was on May 1st, 2018 at 7 pm EST. Amalgamated Security Services invited all nine awardees to an all expenses paid trip to Jamaica where they received their trophies publicly in front of the attending police commissioners, local law enforcement officials, and other invited guests. The three first-place winners won US$5,000 cash for their respective Police Force that nominated them by Amalgamated Security Services. At the ceremony, Amalgamated Security Services received raved reviews and positive feedback from the winners, runner-ups, the ACCP organising committee as well as the Commissioners of Police from the various ACCP. Jamaican Commissioner of Police Major General Antony Anderson said he is honoured that the conference will be held in Jamaica from April 30 to May 4 and extended gratitude to the Secretariat of the ACCP (Association of Caribbean Commissioners of Police) for their support in its planning and execution. 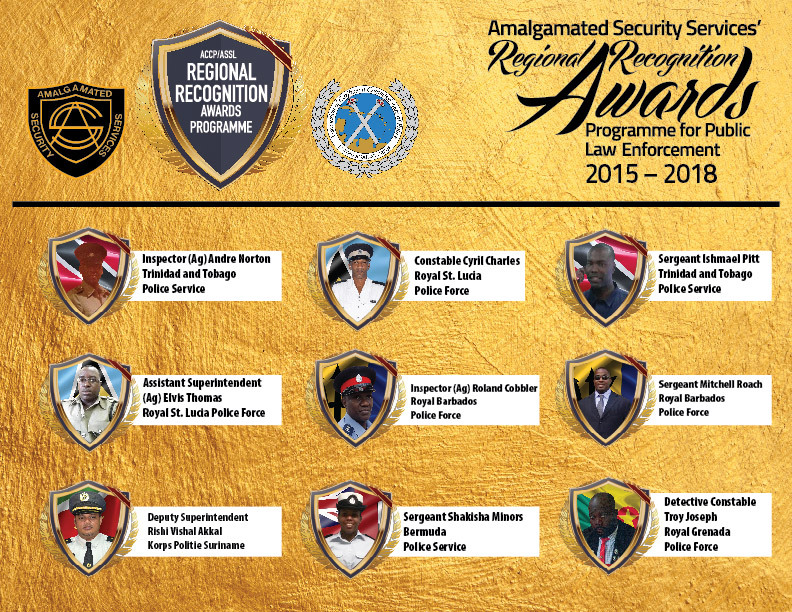 Excellence in policing across the region will also be highlighted through the Amalgamated Security Services Regional Recognition Awards Three outstanding police officers under ACCP member countries will win awards in the categories of Top Caribbean Community Policing Officer, Top Caribbean Crime Fighter, and Top Caribbean Career Move. Copyright 2018 Amalgamated Security Regional Recognition Awards All rights reserved.